Through our work in Africa and India, STG’s team has come to the conclusion that serving rural communities is a proposition that should really be met as a complete picture: improving health care through serving the local clinic, improving education through powering the local school, and positively affecting individual’s quality of life and income-generating capabilities through household connections. We believe that it is extremely important to include the high impact institutions in our vision for rural electrification because they serve the entire community, right away – and energy access is something that should benefit everyone, not just the individuals in the highest income brackets. To best serve these communities – at costs that people can afford – there are a number of different aspects of the problem that must be understood. STG has devoted time and energy into research and development on a number of fronts to make sure that we can do things right. 1 – What are the energy demands of rural citizens and institutions? STG is actively monitoring power usage at a number of rural educational and health care facilities lucky enough to already have electricity access. This helps us understand how much power the schools and clinics use as well as when power is needed (how much is needed overnight when the sun is not out?). We have also generated partnerships with a large number of other researchers and practitioners globally to aggregate available data into a comprehensive model of consumer needs: households (at low, medium, and high levels of usage), clinics, schools, businesses, and community centers. 2 – What are the available (or possible!) technology options for meeting rural energy needs? On this front, STG has coupled field experience installing photovoltaic (PV) and genset equipment with R&D expertise in engineering new and hybrid energy systems (more on that below). We have further quantified costs for different technology options across different markets, enabling us to predict system costs based on given specifications. – How efficient will solar technologies be given local weather (sunlight and temperature)? – How much energy storage (of some type) is required to serve nighttime loads? – How much will it cost to run wires between buildings to deliver power from the central system? – How much would it cost to connect this community to the national grid, and is that likely to happen in the near future? 4 – What is the appropriate business model for rural electrification? This is an open question at the moment, with many different groups testing out different models around the globe. We believe that the holistic picture requires acknowledging that not all energy consumers are alike and embracing those differences. For instance, institutions such as schools and clinics are expected to have fairly stable demand (their activities are similar almost every day) and are generally managed by large organizations with budgetary processes. This makes them great candidates for a contract for purchasing energy, called a Power Purchase Agreement (PPA), where they are charged a simple monthly fee that guarantees a certain volume of energy delivery. On the other hand, household users may have more variable demand based on pay cycles, holidays, school fee due dates, etc. which may be better served by a pay as you go (PAYG) model (like we are used to for prepaid cell phone contracts). So how do we make a complete story out of all of this research? 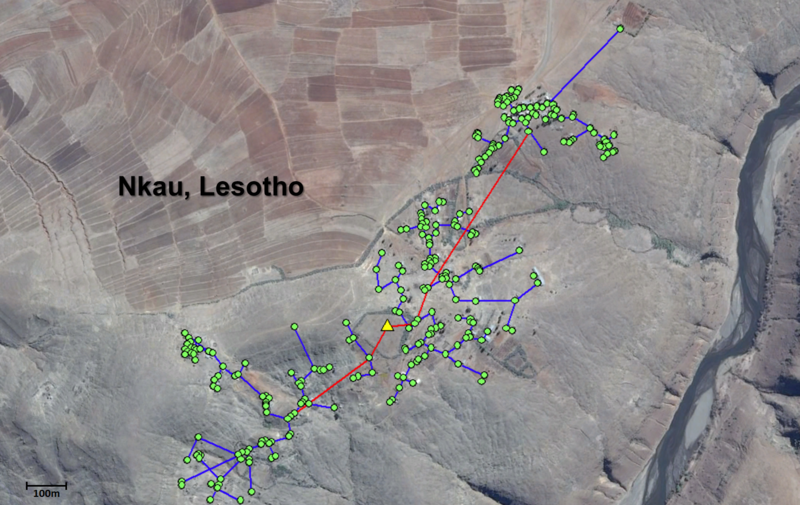 Our Minigrid Design Tool uses our custom Technical/Economic model that intelligently integrates all of this information together: logged climate data (e.g., from NOAA or other weather services), satellite imagery (e.g., from Google Earth), and our understanding of different technologies and community demands. The Design Tool then outputs the optimal energy system to serve the target community and the expected specific (per kilowatt-hour) cost of electricity over the lifetime of the system. Before our engineers even hit the ground, we have a good idea of what the economic proposition would be for this community or for the local utility or independent power producer (IPP) looking to serve the community! We can also determine how many schools, clinics, and businesses are in the areas and approach them directly to secure PPAs and identify large energy loads. 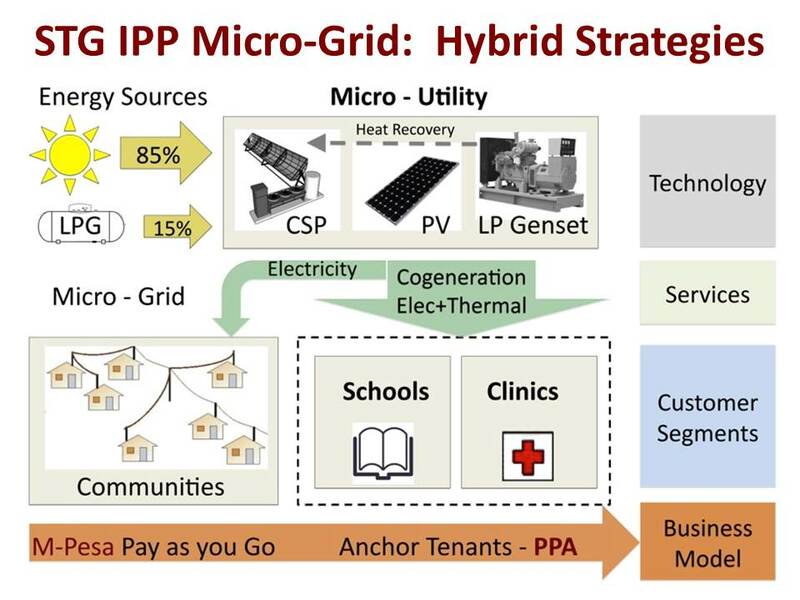 This process simplifies both the engineering and economics of minigrid design. In the interest of brevity, we have left out a lot of the interesting details (dynamic modeling environments, data availability issues, validation procedures, cost of capital effects), but we believe that not only is this an important engineering challenge, it is a solvable one and we are on our way toward making this a reality. Taking a step back to look at the big picture, the following schematic sums up our current thoughts on all of the different aspects of rural minigrid solutions. If you are interested in learning more about any of these components – technical, business, market, or how it all ties together – please email us to learn more!